I love when I have an excuse to make a hydrangea cupcake bouquet! The reaction people have when handed a basket of sugary smelling flowers, is always an awesome one. To start with, I was given the box to use by my customer. I actually prefer rounded shapes, but I was able to make it work. So, off I went with the box to my local craft store in order to chose a styrofoam ball that would fit securely inside of it. I knew I would have to shave down the styrofoam, but I wanted to get as close a fit as I could. Whenever I carve styrofoam, I tell myself that this time I won’t make such a huge mess. Turns out, I like to lie to myself! Anyway, after researching different techniques to cutting styrofoam, I just took a huge knife and went for it. Once the ball was wedged in, I coated it in light green buttercream frosting. For the cupcakes, I actually had baked them in advance and put them in the freezer. I find that it’s easier to attach them when they are frozen. Otherwise they tend to fall off the cupcake liner. You can also use a very firm cupcake recipe. The one I used was very moist so I needed them to be frozen. I used about 3 toothpicks for each cupcake. The hardest layer to stick in is the one closest to the box because the cupcakes end up fighting gravity to stay up. I stuck toothpicks in at an angle in order to help keep the cupcakes upright. This was the most difficult and nerve wracking part. By some miracle, all the cupcakes stayed in place during the event. Finally, I reached the best part, which was to decorate! I spent a while getting the right shade of purple buttercream. Taking a piping bag with a Wilton 2D tip, I coated the inside of a piping bag with the purple frosting and then placed some green down the center. This created the look for the hydrangeas. Once the piping starts, I never know exactly how my cupcake bouquet will turn out. 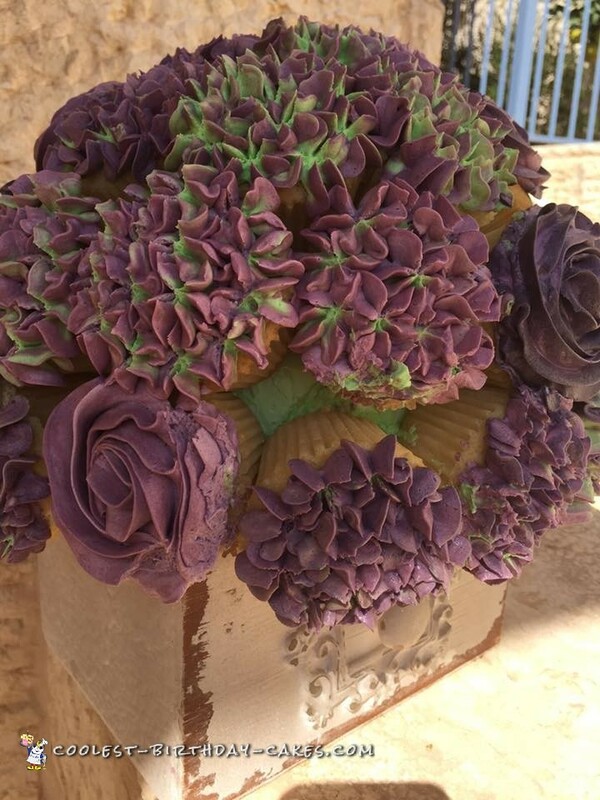 I kind of go with it and hope it turns out ok.
Thankfully, my customer loved the hydrangea cupcake bouquet and people at the event told me afterwards they thought it was made of real flowers! Yay!